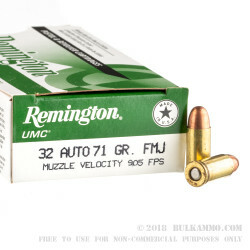 Remington’s UMC line has been a trusted target round of shooters for many years and strikes a good balance of quality and economy. 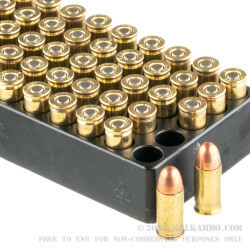 These .32 auto rounds contain a 71-grain, metal-cased round loaded into a boxer-primed, noncorrosive, reloadable brass case. 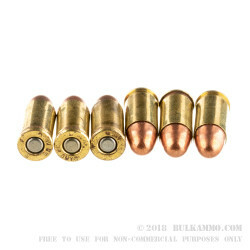 The metal-cased projectile is essentially the same as a traditional full metal jacket round. These rounds, capable of a muzzle velocity of 905 FPS, are an excellent plinking and practice round for your .32 auto pistol. Originally created by John Browning, the .32 ACP was designed for use in the FN M1900 and is also referred to as a 7.65mm Browning. 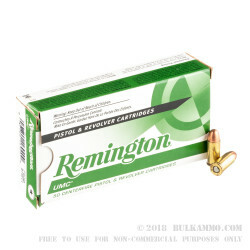 This bulk package of .32 ACP ammunition from Remington contains ten, 50-round boxes. Since 1816, Remington has been a producer of high performance ammunition and firearms and continues to pave the way for innovation at their research and development facility at “The Rock”.